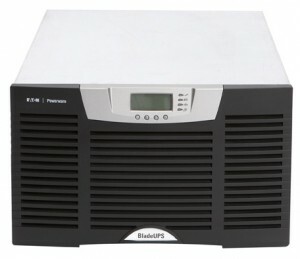 building block fashion to deliver 60 kW of redundant back up power from a single rack enclosure. This powerful configuration delivers higher power density than competitive, modular solutions, while dissapating one-third of the heat.The standard internal batteries provide five minutes of needed ride-through power at full load. Enough for an auxiliary power source to take over or systems are gracefully shut down. Run time can be exended up to 34 minutes at full load or 76 minutes at half load with the use of External Battery Modules (EBM’s). The BladeUPS now comes factory pre-assembled to ease installation. The pre-assembled system is factory installed, tested and placed in a 42U rack. Eaton fully assembles the system, complete with communications cards and system wiring validation prior to shipping. The system is then delivered to you on a single, shock absorbent pallet.